This one is for you, Jenn! 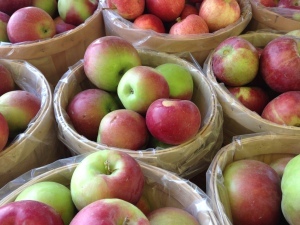 We went apple picking over the weekend (so did the rest of our state it seemed) and I now have an enormous bag of fresh beautiful apples to bake (not even sure what kinds, but they are all so tasty I am not bothered). As an American with a zillion apples in the fridge, the first order of business is making a pie! I was never a fan of cooked apples as a kid, I loved them raw, but once they started cooking and that smell permeated the house, I used to run as fast as I could. 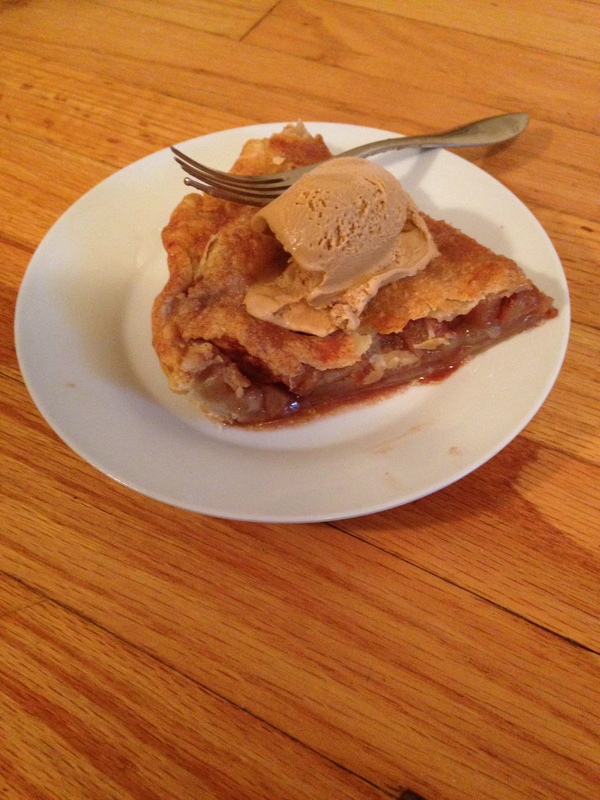 But this pie tastes great even to me, and in my old age, the smell is now a blissful one as I know I am feeding my kids fresh food and teaching them a healthy lifestyle. Position a rack in the lower third of the oven and preheat to 400 F. There are lots of great pie crust recipes out there, but as I mentioned I use the refrigerated Pillsbury pie dough. Peel the apples, then cut them into slices ¼ inch thick (being careful to remove all of the core). 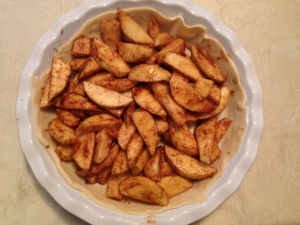 In a large bowl place the apples, orange juice, melted butter, brown sugar, cinnamon and nutmeg. Using a large spoon stir until blended. 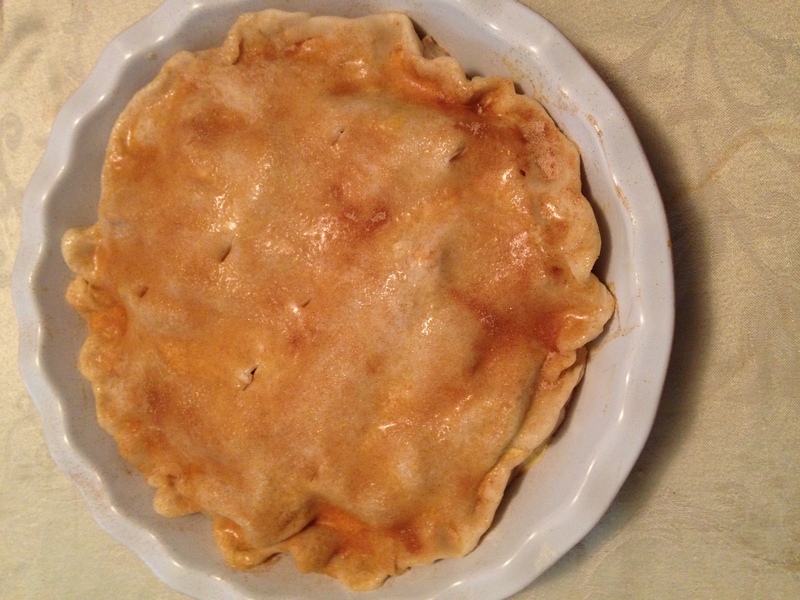 Sprinkle some Wondra flour onto the bottom pie crust (to help it not get soggy). 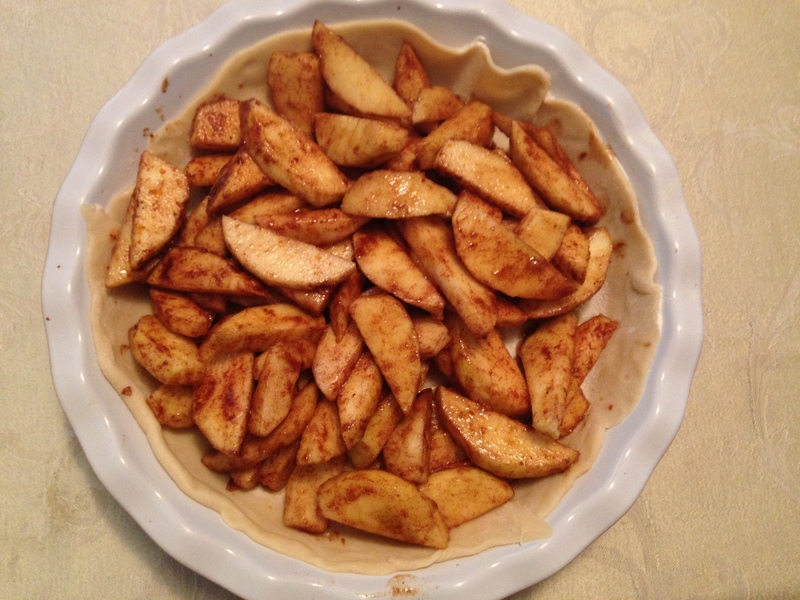 Spoon the mixture into the bottom pie crust and smooth the apples into an even layer. Place the top crust over the filling, lightly press it down and then use your pointer finger and thumb to crimp the edges. Brush the egg mixture over the top of the pie, sprinkle the cinnamon sugar and then vent the pie by cutting small slits in the top crust. Bake the pie for 15 minutes. Reduce the oven temperature to 350 degrees, then continue to bake until the top crust is lightly browned, the apple filling is bubbling, and the apples are tender when tested through the slit in the crust with a toothpick, about 40-45 minutes. Transfer the pie to a wire rack, let cool for about 20 minutes and serve warm (with French vanilla ice cream or like I did above use salted caramel gelato, yummo!) Store the pie covered at room temperature for up to 2 days and rewarm it in a 275 F oven for about 15 minutes, uncovered.